Features a clear, natural-sounding British male voice. 4 sturdy rubber feet; durable, rugged construction. Tucked away behind battery door are rotary volume control and set buttons. Large speaker; easy to hear; contrasting function and speech buttons. This clock was designed over in England, where nobody seems to settle for anything less than the absolute best. And, mark our words, it shows! Our best-selling, easy-to-use cube-shaped talking alarm clock boasts a clear, natural-sounding British male voice. On top of the clock is the one-inch-in-diameter TIME button - which, when pressed, instantly reports the time: "It's 8:32 PM." The speaker on the front of the clock is over two-and-a-half inches square, meaning that it's easy to hear the clock's speech - even if your hearing isn't what it used to be. There are four sturdy rubber feet at the bottom of the clock to prevent it from sliding around on your table or nightstand, plus the clock's weighty feel gives it a well-designed, rugged appearance. But that's not all. There are absolutely no setting buttons exposed anywhere on this clock - which means ... no buttons to bump and accidentally change the time, shut the alarm off, and so on. To set up the clock, simply flip open the battery door (don't worry - the batteries are safely tucked away inside a cartridge so they won't fall out). Above the battery compartment - behind the door - you'll find something unheard-of on a talking clock - an actual rotary volume dial that can adjust the speech output from whispering quiet to almost shouting loud. And the square- and circle-shaped buttons are used to set the time and alarm, turn Hourly Announce on or off, etc. 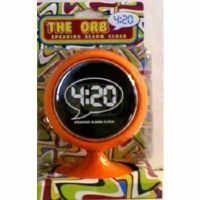 You can also choose your favorite alarm sound from five practical and fresh new selections: cuckoo, low bong, high bong, wind-up bell, and fast beep. 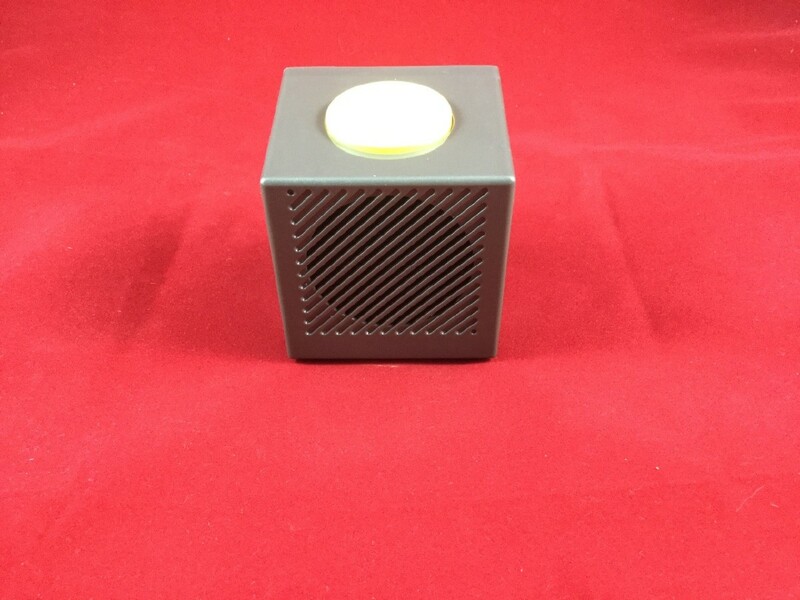 There's still more noteworthy information pertaining to our Talking Cube Clock. All of the function and speech buttons are contrasting - making the clock easier for someone with low vision to use. When setting or adjusting the clock's settings, audible prompts guide you step-by-step through the entire process - making this clock 100% accessible to totally blind individuals. A Snooze alarm is also present, which sounds the alarm for one minute, then snoozes for four more minutes. Directions for the Talking Cube Clock From Future Aids, The Braille Superstore. This simple alarm clock announces the time at the press of a button in a natural male English voice and all mode settings are spoken. Clock features an optional hourly announcement, five alarm sounds and a volume control. A large round yellow button is situated on the top of the clock. This is the Talk button, which when pressed announces the time. There are four round non-slip feet situated on the bottom of the clock, which prevent the clock from moving when positioned on a flat surface. The large speaker grille is situated on the front of the clock. This has a ridged texture. A removable cover forms the back of the clock and there is a small clip towards the bottom of this side, which when pushed up enables you to remove the cover to reveal the clock's controls and battery compartment. With the cover removed you will notice a series of controls within the recessed top section. The square button on the left is the Mode button, which when pressed takes you through all of the mode functions (these are listed in full further on in these instructions). Located centrally towards the bottom edge of this recessed area is the rotary dial for the volume control, which when moved to the left (anti-clockwise) decreases the sound and when moved to the right (clockwise) increases the sound. The round button on the right is the Set button, which when pressed in the mode settings changes the options. Below these controls is the battery compartment. 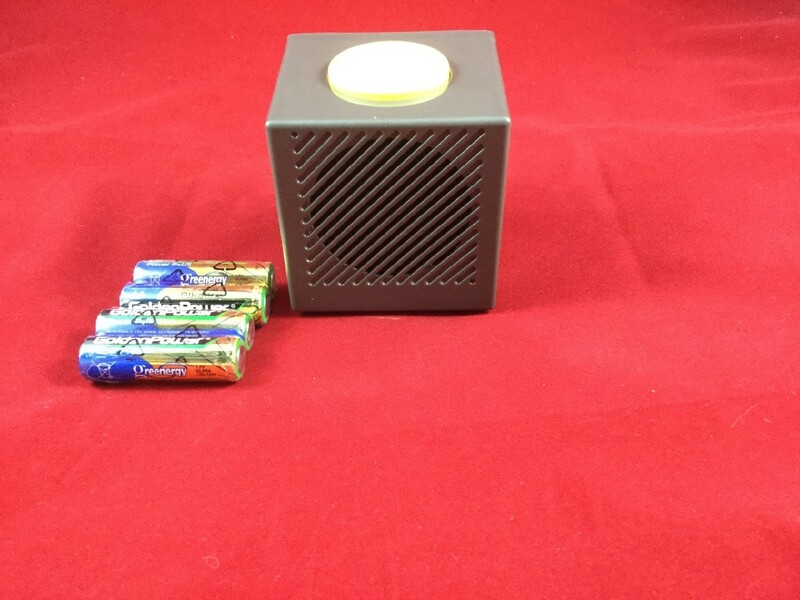 The plastic holder, contained within the compartment, holds the four batteries, two on each side. Remove the battery cover on the back of the clock and take out the detachable battery holder - you don't need to detach it from the connectors unless you find it easier this way. To do this, simply pull the battery holder from the connector pad, which is attached to a small wire towards the left edge of the compartment. The four AA batteries should each be inserted with their negative (flat) ends positioned against the springs in the battery holder. Ensure each battery is fitted securely into the holder and then put the holder back into the battery compartment by re-attaching the holder to the connector pad noting the negative connection on the holder should align to the positive connector on the pad and vice-versa with the other connectors. Please note: After inserting batteries, you will need to set the time before re-attaching the battery cover. Press the Talk button on top of the clock to hear the time announcement. You can then increase or decrease the volume by using the rotary dial on the back. To set the time and/or alarm, or to activate the optional hourly announcement, follow these instructions. The square Mode button is used to enter the menu. To change the settings of the function selected press the round Set button. At any time during set up you can press the large Talk button to return to current time announcement mode or you can simply proceed to the next function by pressing the Mode button once more. Press the Mode button and the clock will say "announce off". Press the Set button and the clock will say "announce on". Pressing the Set button when in this mode will toggle between on and off. When activated, the clock will announce the time on the hour every hour. Press Mode again and you will enter the alarm setting. The clock will announce "alarm off". To change to "alarm on" press the Set button. Set the alarm time by pressing the Mode button again. The clock will say "alarm hour" followed by the actual alarm hour setting (e.g. "alarm hour 6"). Change this by pressing the Set button. The clock will announce each alarm hour as you cycle through them. Press Mode to advance to the alarm minutes. The clock announces "alarm minute" followed by the current alarm minute setting. Change this using the Set button. Note: To advance the minutes quickly press and hold the Set button and the alarm minutes will advance in five minute blocks (five, ten, and so on) until the button is released. The next mode announces "alarm" followed by the current alarm am/pm setting. Toggle this setting between am and pm by pressing the Set button. In the next mode the clock says "alarm" followed by the default alarm sound. Choose from the following alarm sounds: a two-tone alarm, a mechanical bell sound, a horn sound, a cuckoo and a beeping alarm by pressing the Set button. The clock's alarm will sound for one minute at the time set and will then pause for four and a quarter minutes. This process will be repeated five times and then stop, unless you cancel it by pressing the Talk button on the top of the clock. Press the Mode button until the clock says "clock hour" followed by the current clock hour setting. Use the Set button to advance the hours. Press Mode to move to setting the minutes, whereupon the clock says "clock minute" and the current clock minute setting. Change this with the Set button. To advance the minutes quickly press and hold the Set button and the minutes will advance in five minute blocks until the button is released. In the next mode the clock says "clock" then the current am/pm setting. Change this by pressing the Set button. Pressing the Mode button once more will return the clock to the current time announcement mode which can also be used to confirm your time setting. To confirm the alarm status, simply press the Set button in the current time announcement mode. The clock will announce the current alarm settings - alarm sound, alarm on/off and the alarm time. This action will not change any of the clock's settings. Reset the clock's settings to default by removing and re-inserting the batteries.